Learning was cancelled at 48 schools in the Western Cape today as 2 400 teachers and learners joined a Sadtu protest march calling for the firing of Basic Education Minister Angie Motshegka. 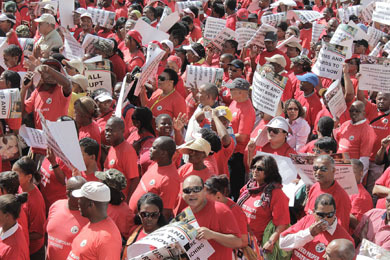 The protest march organised by the SA Democratic Teachers Union (Sadtu) had the support of Cosatu, National Education, Health and Allied Workers Union (Nehawu) and the Police and Prison Civil Rights Union (Popcru) among other unions. Equal Education, a NPO pushing for better education standards in South African schools, was also present. The marcher formed a sea of red as they congregated in front of Parliament after marching through the city yesterday. Preliminary reports from the Western Cape Education Department indicated 67 schools were affected, with MEC Donald Grant expressing disappointment that the campaign would affect learners “at a critical time of the academic year”. He said the department reserved the right to apply the “no work, no pay” rule stated in the Labour Relations Act could be brought to bear on teachers who participated in the march instead of being in the classroom. In a statement, Grant’s spokesperson Bronagh Casey 2 400 teachers took part in the march which resulted in 48 schools being shut down. The protesters marched to Parliament under police watch where they handed over a memorandum of their demands to Charles Ford and Tau Motsepe from the Presidency. Various messages written on banners were held aloft, they included “ Fire Angie Motshekga”, “ Fire Bobby Soobrayan”, “ No to closure of schools”, “Away with declaring education an essential service” and “Fire all corrupt officials”. Additionally, placards read: “ Pay rural allowance”, “Pay norms and standards” and “No to mud schools”. Some of the learners who joined the march along with their teachers were from schools such as Valhalla Secondary School in Elsies River and Luhlaza High School in Khayelitsha. Among their concerns, the learners said their schools lacked sufficient classrooms, teachers and textbooks. In its memorandum Sadtu said Motshekga should allocate more resources to poor schools, scrap the competency test for grade 12 markers and investigate alleged wastage of public funds by Grant for contesting the Constitutional Court ruling after losing his plans to shut down 27 schools in the province. They urged Premier Helen Zille to fire Grant over the matter.